Mark Shasha (b. 1961) is an award-winning American artist, author and educator. His work has appeared in exhibitions, museums, galleries and publications for almost 40 years*. His paintings and prints are found in public and private collections around the world. And millions have read his children's books which he has written and illustrated. After graduating from the Rhode Island School of Design in 1983, Shasha illustrated for the Boston Phoenix, The Boston Globe and other publications. His first children’s book, “Night of the Moonjellies” (Simon & Schuster, 1992) won a Marion Vannett Ridgway Honor Award and was welcomed by Smithsonian Magazine as “a classic.” It continues to appear on some bestseller lists. His work led to invitations to elementary schools and libraries where he delighted thousands of children with his stories, songs and drawings. In recognition of his “outstanding contribution to the education of young people” Mark was given theShining Star Award by The Children’s Museum of Southeastern Connecticut. Shasha’s artistic focus shifted to studio and plein air oil painting – his subjects are the light and textures of nature which he approaches in a traditional style blending oil painting techniques of 19th and 20thcentury masters. Notable awards and solo exhibitions at galleries and museums have contributed to his success and national recognition. Mark is included in prominent art events throughout the country including the Forgotten Coast en Plein Air, Plein Air Easton,Cape Ann Plein Air and En Plein Air Texas. 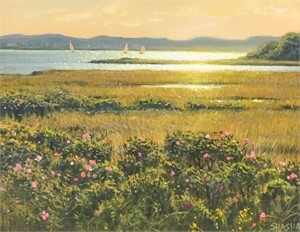 He is an elected artist member of The Salmagundi Club, The Guild of Boston Artists, The Copley Society, Rockport Art Association & Museum, North Shore Arts Association and other venerable art institutions. His recent awards include the2018 Plein Air Easton Artist’s Choice Award, Oil Painters of America Award of Excellence and the Alden Bryan Memorial Award for Excellence in Landscape Painting (awarded to Shasha twice in one year). Shasha frequently appears on stage as an actor and singer. Recent productions include Best of Broadway, The Miracle Worker, Twelve Angry Men and Willy Wonka. He has twice been a singer for the July 4th fireworks show with the Hillyer Orchestra in Salem, Massachusetts. In addition, Mark performs his multi-media presentation "Art Up!" which riffs on how the Renaissance and the enduring ideas of the Enlightenment improve our lives. Mark Shasha “A man of unbounded creativity” - North Shore Magazine Mark Shasha (b. 1961) is an award-winning American artist, author and educator. His work has appeared in exhibitions, museums, galleries and publications for almost 40 years*. His paintings and prints are found in public and private collections around the world. And millions have read his children's books which he has written and illustrated. After graduating from the Rhode Island School of Design in 1983, Shasha illustrated for the Boston Phoenix, The Boston Globe and other publications. His first children’s book, “Night of the Moonjellies” (Simon & Schuster, 1992) won a Marion Vannett Ridgway Honor Award and was welcomed by Smithsonian Magazine as “a classic.” It continues to appear on some bestseller lists. His work led to invitations to elementary schools and libraries where he delighted thousands of children with his stories, songs and drawings. In recognition of his “outstanding contribution to the education of young people” Mark was given theShining Star Award by The Children’s Museum of Southeastern Connecticut. Shasha’s artistic focus shifted to studio and plein air oil painting – his subjects are the light and textures of nature which he approaches in a traditional style blending oil painting techniques of 19th and 20thcentury masters. Notable awards and solo exhibitions at galleries and museums have contributed to his success and national recognition. Mark is included in prominent art events throughout the country including the Forgotten Coast en Plein Air, Plein Air Easton,Cape Ann Plein Air and En Plein Air Texas. He is an elected artist member of The Salmagundi Club, The Guild of Boston Artists, The Copley Society, Rockport Art Association & Museum, North Shore Arts Association and other venerable art institutions. His recent awards include the2018 Plein Air Easton Artist’s Choice Award, Oil Painters of America Award of Excellence and the Alden Bryan Memorial Award for Excellence in Landscape Painting (awarded to Shasha twice in one year). Shasha frequently appears on stage as an actor and singer. Recent productions include Best of Broadway, The Miracle Worker, Twelve Angry Men and Willy Wonka. He has twice been a singer for the July 4th fireworks show with the Hillyer Orchestra in Salem, Massachusetts. In addition, Mark performs his multi-media presentation "Art Up!" which riffs on how the Renaissance and the enduring ideas of the Enlightenment improve our lives.